9 Mary Gibbons 13.38 1st in class; 12 Patrick Gibbons 14.12 4th in class; 13 Catherine Gibbons 14.53 2nd in class. Terry Lonergan reports ... "4300 runners dropped to their knees on Saturday night praying that the prevailing gale force winds would abate for the following day's race. Their prayers were only partially answered as a very troublesome wind served to hamper the progress of over 3000 eventual starters for 2/3 of this major race; reputed to be one of the fastest courses in the U.K.
One Harrier taking up the challenge was Terry Lonergan. Running his 78th half marathon, he finished 152nd out of 3241; 4th of 273 in the 50/59 age category; time being 84.57, averaging 6.29 per mile." Andy Wiggans was 514th in 1:35:04, Bob Wightman 746th in 1:40:00 - there were 3241 finishers. (AL, 21m/4500') Although Roy Ruddle and Geoff Howard received a battering from the elements in the final stages of the Edale Skyline on Sunday they finished 41st (3h 36m 58s) and 51st (3h 41m 29s – 1st o.60) respectively in a field of over 200 starters. Not having entries to the Half Tour of Pendle and lured by the prospect of lunch in a cafe in Hebden Bridge Jo and Jim ran the Midgley Moor Fell Race in Calderdale (AS 5 miles, 1250ft). 49 hardy, or perhaps I should say masochistic, competitors set off to battle with the weather, which at times made it difficult to stand upright let alone run and led to slower times than previous years! Having only just made it on time after navigational challenges on Calderdale's country lanes, JCBs and tractors we discovered that there was a choice of route as long as 6 checkpoints were visited. After such a display of navigational skill in the car Jo elected to follow the man in front! Jim finished 5th in 46.20 and Jo was 24th and 1st lady in 55.17. Oh, and lunch made it all worthwhile! Vic Verecondi reports ... The weather was very rainy and windy which proved slightly difficult at times. An interesting course around Stanley Park. The race course was of two laps with small parts of the race on an athletics track. Finished 91st out of 395 runners and achieving a PB of 44:57. Quite pleased with the time. Ilkley Harriers included Roy Ruddle 23rd in 4h58, Heather Maud, Iain Mann, Chris Porritt, and Amanda Parnaby - no times available yet. The Ilkley Harriers Runner of the Month for February is Andy Wolfenden - click here for details. More on Baildon Runners' web site. Andy Wiggans was 126th out of 344 in 69:06 - and actually led the race for a short way after half the field turned the wrong way just after the start! Full results on the Tod Harriers web site. Thanks to all the Harriers who helped make this year's fell race such a great event. We had a record field, with 281 Senior finishers including 30 Harriers, and nearly 70 Juniors, yet everything ran smoothly. We witnessed Simon Bailey set a superb new course record (the old record had stood since 1998), and there was a pleasant, friendly atmosphere that everyone enjoyed. Results on the Fell race page. More photos, with thanks to Peter McWilliam. This year, Ilkley Harriers proudly fielded a men's team in the English National XC Championships. The venue, Temple Newsam, Leeds, will be familiar to some from local XC races, but it was a lot harder. The men ran 3 laps on a winding, hilly, 11.8km course that was very muddy in places. We had 532 Jim Ryder in 52.43, 704 Nick Pearce in 55.26, 712 Jamie Hutchinson in 55.33, 728 Terry Lonergan in 55.50, 917 Neil Chapman in 58.41, 929 Jon Sage in 58.53, 1058 Phil Chappell in 61.19, 1135 Paul Wood in 63.11 and 1288 Andy Kitchen in 68.28 (1394 ran). We were 85th out of 116 teams, and 45th in the 9-man team competition. The ladies ran 2 laps of the same course - we had 152 Alison Bennett in 39.26 and 197 Cath Wolfenden in 41.12 (454 ran). Thanks to the many Harriers supporters who cheered us on! Info on NoEAA web site. Peter Cooke reports ... The final race in the Sports Direct Cross Country League was held on Sunday 15th February. Based at the South Leeds Stadium the 5-mile race was over a very pleasant and interesting woodland course. Ilkley ladies were hoping to maintain or improve on their position in the league. The team were led home well by Helen Sedgwick in third place who was well supported by Alison Bennett in 6th place and Alison Eagle in 7th. Following and packing well were; Elizabeth McCann, Suzanne Bickerdike and Barbara Bullock in 31st, 32nd and 33rd places, Shirley Wood in 45th, Chris Porritt 51st and Amanda Parnaby 62nd. The initial results indicate that Ilkley have finished second overall to Horsforth in both the ladies and ladies vets competitions. The men responded to pleas to support their Club and dragged themselves from their sickbeds and warmdowns from previous days’ races to ensure a full team competed. The results were Graham Pearce 13th, Jonathan Sage 33rd, Rob Reynolds-Jones 41st, Jeff Paget 53rd, Dennis Ackroyd 67th, Paul Wood 68th, Neil Chapman 73rd, Peter Murray 74th, Peter Cooke 87th and Morgan Williams 95th. For the men, the initial results suggest a 5th place finish with 6th in the veteran’s competition. Peter Cooke reports ... The 20 mile long Wadsworth Trog race was run on Saturday over the Pennine hills above and around Hebden Bridge. Rob Jebb of Bingley Harriers was the winner in a new course record of 2 hours and 42 minutes. There were some excellent performances from the competing Harriers with Roy Ruddle 22nd in 3.28, Ian Marshall 30th in 3.37, Ashley Hardwell 42nd in 3.45, Rupert Kempley in 3.45, Bob Wightman 68th in 4.01 and Neil Chapman 71st in 4.02. In the Half Trog, run in conjunction with the full event, second claim members Jason Hemsley and Stefan Macina were 2nd and 3rd in 1.14 and 1.15 respectively. A great turnout of Harriers for this glittering occasion. The ILT&SC bar provided a congenial venue - a good old chat was followed by an excellent curry supper, the awards presentation presented at a great pace by Chairman Richard Gray, then a chance to strut your stuff om the dance floor. Front row:Paul Wood, male member (!) 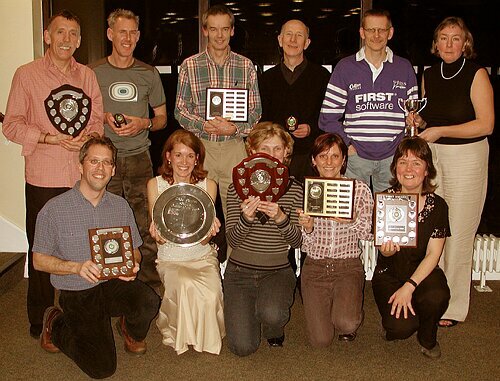 of the year; Alison Bennett, Best Female Runner; Emma Barclay, Ladies' Captain's award (jointly with Chris Porritt); Alison Eagle, Most Improved Female Runner; Shirley Wood, Female Member of the year. Not shown: Graham Pearce, Most Improved Male Runner. The Ilkley Harriers Runner of the Month for January is Terry Lonergan - click here for details. Any roadrunner put off this event by the advertised description of "Trail" need not have worried. It proved to be 100% road - mainly flat and attractively mainly traffic free on tarmac paths. The strong winds would work against improved finishing times and so it proved with the 2 Ilkley Harriers content with their "solid" performances, with the hope of better conditions to come. For the record Terry Lonergan was 41st 39.44 (4th O/55); Catherine Wolfenden 106th 43.43 (7th Female overall). 384 finished. Not a PB course but none the less well worth the journey. Neil Chapman reports ... A superb turnout of 33 Harriers tackled the 25 mile Rombalds Stride in cold and windy conditions, with the later finishers also encountering driving rain. Many were tackling this tough race for the first time. First Harrier home was Andrea Priestley, having a good run in 3:01:55, finishing first lady and fifth overall. Dominic O'Hooley was our first man home 10th in 3:11:27, followed by Sally Malir who battled to finish 19th and 3rd lady in 3:24:06; just ahead of Mike Baldwin 20th in 3:24:06 and Ian Marshall 21st in 3:24:31 Then came 29 Ashley Hardwell 3:26:47; 33 Neil Chapman 3:28:57; 37 Clive Smith 3:35:13; 41 Alison Eagle 3:39:47 (5th lady); 44 Andy Sumner 3:42:34; 45 Jamie Hutchinson 3:43:09; 48 Rob Pawson 3:46:50; 49 Jo Foster 3:46:50; 54 Morgan Williams 3:51:20; 66 Peter Sibley 3:57:28; 69 Keith Wood 17 minutes faster than last year in 3:58:17; and 72 Rebecca O'Hooley in 4:00:31 A little further behind Joyce Marshall had a battle on to hold off a charging Bridget Doherty, both finishing in 4:04 (Joyce 78th 4:04:14, Bridget 79th 4:04:54). Then came the husband and wife team of Kevin and Rachael Gooch, finishing in 86th/87th 4:11:01, followed by Richard Gray 91st 4:14:19, Suzanne Akeroyd 92nd 4:21:32; 95th Richard Midgley 4:22:42; 105 Linda Wright 4:24:39; 107 Susie Jollie 4:25:59; and 110 Heather Maud 4:29:33. Pete Shields in his first race for 18 months due to injuries finished 115th in 4:31:35; finding time to do some coaching on unsuspecting Harriers on the way, followed by Barbara Bullock 130th 4:45:07; Vince Gibbons 135th 4:46:48 and Roger Pyle 203rd 5:13:26. Amanda Parnaby and Jane Cullingworth ran the whole race together finishing with a smile in 5:20:38, the same time as last year. Second-claim Harrier Antonio Cardinale was 170th in 5:01:52 Well done to all who ran. The events for 2004 were decided at the February C'tee meeting - click for details . The 3 Ilkley Harriers"club places" in the London Marathon have gone to Andy S, Dominic and Rebecca - good luck to them! Vince Gibbons was the sole Ilkley Harrier in this event, indeed the only Harrier racing this weekend it seeems! In what used to be known as the Dewsbury Classic 10k, Vince ran a PB of 45 minutes dead for 277th place out of 657 finishers. Results on Dewsbury Road Runners web site. Half marathon road race, York. Neil Chapman reports ... There were eight Harriers out at York Half Marathon running in good conditions, on a sunny but frosty morning. I was first Harrier home 68th in 1:24:10, with Ewan Welsh next 168th in 1:31:09 and Suzanne Akeroyd our first lady 214th in 1:34:10. There was little between the next trio, with Keith Wood 261st 1:36:56, Andy Wolfenden having a good run 273rd in 1:37:36 and Rob Pawson a short distance behind finishing 277th in 1:37:50. Richard Midgley was almost a minute faster than last year 397th in 1:43:26, with Amanda Parnaby our second lady finishing 749th in 2:05:35, a little slower than last year, but a great run given that she had completed a 28 mile race only seven days earlier. BM 7m/1200' Lots of weather, and a free malt loaf at the finish! Ian Holmes led from the start to win in 45:16 (for the 10th consecutive time), ahead of British Fell Champion Rob Jebb 47:03. Second-claim Harriers Jason Hemsley and Stefan Macina of P&B were well up, 7th in 48:57, and 23rd in 52:42. Many of the usual faces were missing, having done XC duty the day before, or the Brass Monkey, but the fell stalwarts were 53 Mike Baldwin 57:16; 54 Geoff Howard 57:23; 69 Helen Sedgwick 58:39 3rd lady behind Sharon Taylor and Sarah Rowell; 73rd Ian Marshal 58:58; 83 Ashley Hardwell 60:30; 85 Rupert Kempley 60:57; 102 Norman Bush 63:37; 178 Rachael Gooch 70:13. A raffle after the race raised over £60 for the John Taylor Foundation for young athletes. Junior results & photos on the Junior Harriers pages. Terry Lonergan reports ... Phil Chappell's monumental efforts over the previous week in bringing a team to the start line proved successful when the club recorded a full team score for the first time in several years. First Harrier to complete the arduous 12km parkland course which offered very little firm going was JIM RYDER (234th in 51.16); NICK PEARCE (V50) (311TH in 52.51) was one stride ahead of the closing TERRY LONERGAN (V55) 312TH in 52.52. 300 places down on his finishing position 40 years ago!! but pleased none the less. An isolated JON SAGE was 408th in 56.26 suffering possibly from an over enthusiastic start. JAMIE HUTCHINSON (497th in 58.33) recovered having lost a shoe in the mud to finish just ahead of PHIL CHAPPELL (501st in 58.45). MORGAN WILLIAMS provided back up in 601st place (63.33). 679 took part. The ILKLEY HARRIERS team finished 47th of the 60 teams who managed to finish 6 counters for the team score. However, 147 clubs were originally entered ; hence 87 clubs failed to turn out 6 men or just did not turn up! Well done, Phil! Phil adds ... good support from Pat Lonergan, Andy Sumner, and from the Otley supporters. Great day, great spectacle but hard race. Results on NoEAA web site. Chris Porritt and Amanda Parnaby were first ladies team: run 1 mile together, split to run different 20 mile legs; then rejoin to do the last 8 miles together! The Ilkley Harriers Runner of the Month for December is Vince Gibbons. For the ladies we had 4 Alison Bennett 39:23; 6 Jo Foster 41:33; 24 Bridget Doherty; 26 new member Cassie Thomas; 41 Shirley Wood; 42 Bernie Gibbons; 44 Chris Porritt; 57 Amanda Parnaby. We were 2nd team on the day, holding on to 1st place overall. For the men 27 Geoff Howard; 40 Eddie Winslow; 57 Jeff Paget; 64 Neil Chapman 39:24; 84 Morgan Williams; 114 Andy Kitchen. We were 5th team on the day, 4th overall. Well done to everyone who ran, but we need a better turnout at the next 2 races! Results on Abbey Runners' web site. The final race in the WYXC series. In the ladies race we had 14 Cath Wolfenden 23:50; 16 Alison Bennett 24:25. We believe Alison finished 2bnd overall in the series in her age class. In the men's race, we had 100 Terry Lonergan 36:00; 109 Jamie Hutchinson 36:47; 117 Ewan Welsh 37:30; 124 Neil Chapman 38:18; 133 Phil Chappell 39:40. We believe Terry finished 3rd in his age class in the series. Results on the Complete Runner web site. Bernie Connor organised three Harriers teams in the Nidd Valley Great Ringway Relay, a friendly relay organised by Nidd Valley Road Runners, with some 30 teams this year. On the first, ladies-only, leg we had new member Cath Porritt, chased in by Shirley Wood, and Ros Blackburn. After that it's a litttle less clear (to me, at least ...) On the 2nd leg we had Paul Wood, and Howard Allen. On the third leg, Graham Pearce went off like a rocket - Andy Sarah and Bernie Gibbons in his wake. On leg 4, from Harlow Carr. we had Jamie Hutchinson, Norman Blackburn, and Bernie Connor. And on the final (glory) leg, Nick Pearce, Keith Wood and Andy Sumner running in an Ilkley vest for the first time and gaining two places. Ilkley had 6th, 23rd, and 28th teams. 22	02:57:01	We Don't Cheat! The relay raised over £320 for the Bilton Conservation Group for the upkeep of the route including the Gorge which has had work done recently - new mesh over the duckboards etc. 3M from Silsden - locals Graham Pearce and Kay Pearce (in her first race ever!) were 4th and 32nd respectively.